Well, temptation got the best of me, but first let me fill in the unaware about Echo Bridge's whoring of their fresh Miramax licenses. My first encounter was with their From Dusk Till Dawn and Hellraiser double feature DVDs (see here). Little did I know EB was rolling out a cavalcade of other cheap double features, triple features, and even quad-feature configurations. That sounds great until you realize, like the double features detailed in that link, the cheapie distributor is packing everything onto one disc. Although they're also releasing individual discs of individual films. For example, you can buy each of the three From Dusks, the first film paired with Full Tilt, a double feature of the two sequels, or all three with Full Tilt. My advice is to steer clear of the multi-packs, cramming feature-length films together in such ways can only lead to ugly quality. I'd also be weary of the distracting jerky motion I spotted on the From Dusk double feature on four different players appearing on others. It remains to be seen whether the individual title discs have encodes that take advantage of the added disc space or all editions feature the same bitrate-starved presentations. So how's one of their first Blu-ray releases? Unsurprisingly mediocre. I found Halloween: H20 cheap from a third party seller and I figured I'd take the bullet. As noted here, the film is presented on this BD incorrectly framed at 1.78:1 originally from 2.35:1 widescreen. Being shot Super35, the picture isn't necessarily cropped, but EB felt the need to remove the matte bars to the "no black bar" ratio. Regardless of this asinine move, the 1080p picture quality is pretty bland. The good news is that there's no real evidence of noise reduction, motion issues, or edge enhancement. 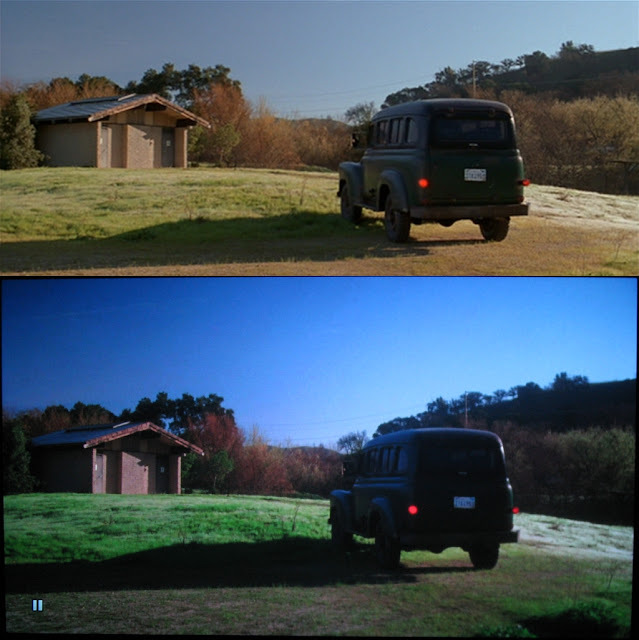 Color is also noticeably more natural looking (yet who knows if the DVD's "tan" color was what's intended). The bad news is that definition is aggressively soft. Finer textures like skin and clothing simply don't have the increased clarity we're used to seeing on Blu-ray. Although the original photography has always had a gloomy overcast. 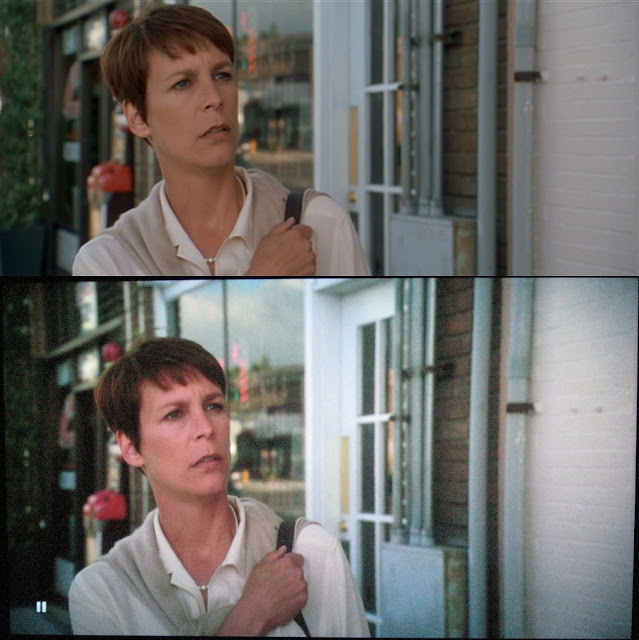 Instances of film damage are identical to the DVD. The sole sound option is DTS-HD Master Audio 2.1. That is lossless, sounding okay for stereo, but there's no excuse for EB to not provide 5.1 like every previous DVD of this sequel. They obviously had access to the material. Pathetic considering even micro studios releasing junk HD aquarium and wildlife screensaver Blu-rays mustering lossless surround. That quality is ridiculous and atrocious. Thank you for taking a bullet for us, because I now know to steer clear of all these titles. Just to let everyone now, a bunch of their Miramax DVDs are already at Kmart as well as Wal Mart. Only get 'em cheap if interested at all. All of the new Echo Bridge Blu-Rays are available at K-Mart for $7.99 each. No, they're not the greatest, but at least they're being released on Blu-Ray. These films have never been given the proper treatment, because the studios don't see them as worth the investment of paying for new transfers, extras, etc. It's the sad reality. Wow.. that looks terrible. I think the DVD's upscaled will look better. Incidentally over at blu-ray.com they reviewed Hellraiser 4 and gave the picture quality a reasonable grade. I just got back from a trip to The Big K and picked up From Dusk Til Dawn, Halloween 6 and Hellraiser Bloodline for $7.99 each. They didn't have H2O, not that I would have bought it anyway, but they did have Resurrection on DVD. Hellraiser 4 in that Parts 3/4 EB double DVD is the best looking of these Miramax ports I've seen so far. Better than the old Dimension disc, so it makes sense the BD would look pretty decent. Anthony, I just got back from Kmart too, saw all those you mentioned and also no H20 but they had the badly cropped EQUILIBRIUM Blu-ray, stay away from that one! That's why I picked up Hellraiser 4. I'll stick to the original DVDs for the remainder of the series for the anamorphic transfers and 5.1 audio. I also saw Equilibrium too and passed. Those three will probably be the only Echo Bridge Blus I buy, unless they step up their game... which I doubt.